This vintage Swank cuff links and tie clip set is in a silver-tone finish. 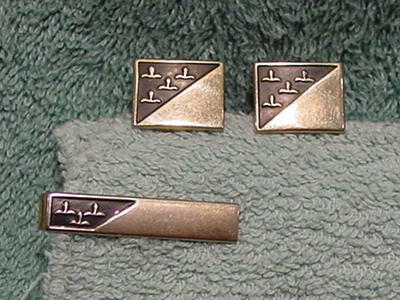 The upper left side of the cuff links and the left side of the tie clip have a black inset with silver-tone designs. The silver-tone finish has a charming tarnished appearance with some faint age pitting. The tie clip also has some of the black paint missing on the right side. It's from a former male model/actor.